When it comes to aging, the neck and décolletage have always been the culprit in showing the first signs of aging. More often than not, one tend to notice many women with beautiful flawless faces but their skin near the neck area looks aged with neck wrinkles and sagging skin. To avoid these disasters, you have to protect this particular area that is usually left out during our daily skincare pampering session. 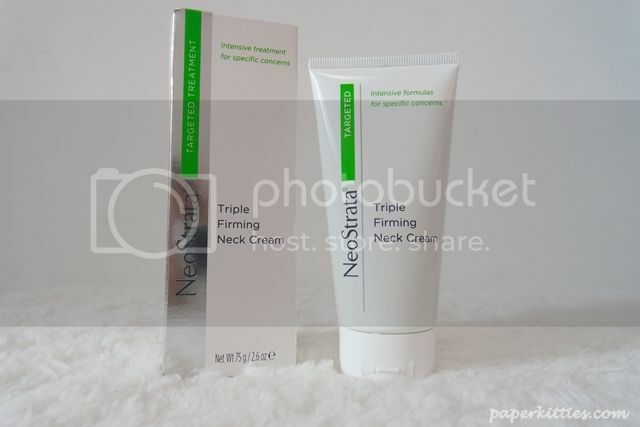 Introducing NeoStrata Triple Firming Neck Cream, it aims to help rebuild the skin’s matrix, encouraging pro-collagen and hyaluronic acid and protecting skin’s essential cells, to lift and firm skin and even tone to diminish the appearance of age spots. Formulated with a powerful blend of NeoStrata proprietary and other selectively sourced ingredients, NeoStrata Triple Firming Neck Cream specifically target the lines and folds on our neck – plumping the neck lines from inside out, provides hydration to the skin. And not forgetting, it also promotes an even skin tone, allowing it to glow just like your face! Well, needless to say, I am one of those guilty ones who have neglected my neck and décolletage for the longest time! I reckon the only time I ever apply anything on my neck is when I have excess product and no surface area left on my face to apply :p Ever since I’ve received NeoStrata Triple Firming Neck Cream, I no longer have any excuse to neglect my neck~ Been using it for a month now and what I really like about it is how soothing it always feels whenever I apply it on my neck and décolletage, as though my skin was instantly hydrated. The texture of the cream is very smooth and silky, not at all greasy. My skin does look slightly tauter and more supple after prolonged usage. Not sure what to pamper your mommy with? This would be one of the best bet!